Tara and Jason’s classically elegant wedding at the Hilton Pearl River was just filled was amazing moments! After knowing each other most of their lives, Tara and Jason’s wedding day was cause for celebration, not only for the happy couple, but for their families as well (and you’ll see why when you read their love story)! Tara was described by her friends as driven, confident, loving and always willing to go above and beyond for others; Jason was described by Tara as having “the biggest, kindest, and genuine caring heart,” which makes it easy to see why these two fell for one another! Jason and Tara’s first look was held on the bridge outside of the Hilton. The sweetest moment happened when Jason turned around to see his bride and he could hardly hold back his tears…it definitely made us reach for some tissues! After the first look and some photos, it was time to head inside for the ceremony. Honoring traditions, their indoor ceremony was just beautiful — the warm glow from the candles and the gorgeous white floral adorned chuppah made the room feel cozy and intimate, even though they were surrounded by many loving friends and family members! At the reception, Tara’s father toasted the union, and told everyone that "when Jason came into Tara's life, there was a special glow that I saw and Tara told me, this is the one." And after the first dances, the Horah started and it was so much fun… everyone was on the dance floor all night celebrating! Sometimes family really does know best! Jason's mom and Tara's aunt decided it was officially time to become family; so they made a match! So, after several conversations, Tara and Jason had their FIRST first date! Then 3 years later....a second first date occurred. After an amazing time in the city, the rest was history! 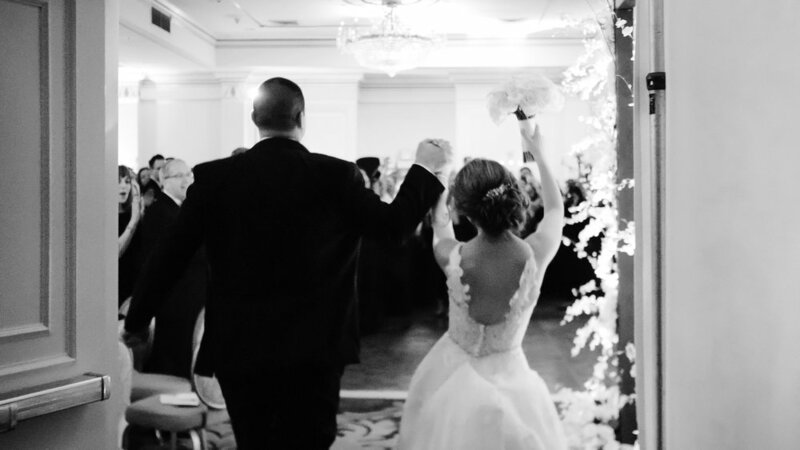 Tara, in Hoboken, and Jason, in West Nyack, they made the distance work. A year later from their first date, they moved into an apartment together to make their first home! Some time went by, and one day Jason told Tara that she could not work on October 8th…he told her that they would be doing breakfast, golf (for his birthday), a special event, then dinner. That day Jason made breakfast in bed, and Tara got ready for golf but, also packed a bag for the special event. During golf, Jason’s uncle told them he had to go help his aunt because she had a flat tire. So, Tara and Jason finished that hole and then moved on to the next. When they got to the 7th hole, a tee and ball were set up with a rose. Jason made a comment such as, "who would leave a ball teed up." Tara agreed that it was weird. She began to walk out and then realized she didn't have her tee and ball. So she went back to the cart to get it. Jason had suggesting using the one out there but Tara insisted on getting her own. Then she finally walked out to hit. Jason followed her out, where she picked up the ball. She read it several times, and it said "Marry Me 10.8.2017.” When she turned around Jason was on one knee and said, "Marry me?" Tara responded, "really?!?!" So they weren’t golfing for his birthday after all, and his aunt did not have a flat. Jason's uncle went to set up the engagement on the 7th hole! Then, Jason told Tara there is no special event, but they had dinner reservations at 7:30 so that they could tell their parents. On the way to Tara's parent's house she tried calling every person in her immediate family at least once, but no one answered. But when they entered her parent’s house, she discovered that Jason arranged to have both immediate families at the house and had even hired a chef for a beautiful night celebrating the engagement!